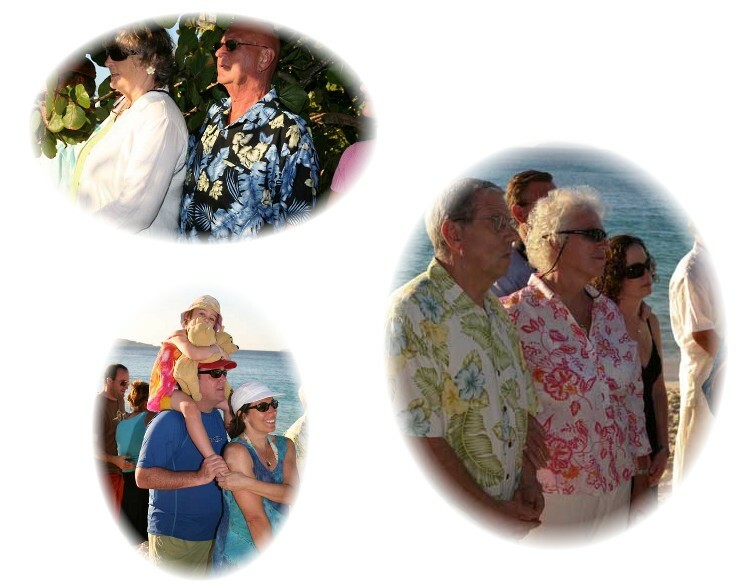 ST. JOHN – Love was on the lips of 95 married couples who renewed their devotion the island way on Valentine’s Day: beachside. For the sixth year in a row, Trunk Bay hosted a poignant “Celebration of Love” vow renewal ceremony at sunset. The event is organized annually by the Dove family and presided over by the Rev. Anne Marie Porter as a way to honor the commitment, sacrifice and beauty that marriages entail. The pairs represented a collective 2,065 years of marriage – and 60 of those years belonged to one couple, Barbara and John Achzet of St. John. As the group clustered in a semicircle, Barbara Achzet beamed and pumped her fist in the air as the length of her marriage was announced, and everyone cheered. Not far behind in duration were Bob and Nancy Barlow of St. John, at 57 years together. They renewed their vows Thursday for the fifth time. “It’s very romantic and brings back lots of happy memories – lots and lots,” Bob said. Greg, who lives in Maryland, said he was inspired by his parents’ marital philosophy: sharing. “You’re in it together and you do things as a team,” he said. The younger couple said their goal wasn’t necessarily to match the elder Barlows in length of marriage, however – to accomplish that, they would have to live to be 105. Wives arrived wearing everything from an original, 30-year-old wedding dress to a bikini. Hand-in-hand with their husbands, many strolled to the beach to the bright notes of David Banzhof’s flute, then kicked off their shoes on the sand. Vocalist Shikima Jones sang “What a Wonderful World” as the ceremony opened, inviting the participants to join in on the signature lines. The couples took deep, relaxing breaths as she instructed them to “focus on this sacred moment,” then to turn and face each other. Some had tears in their eyes as they gazed, while others bent in to rest their noses and foreheads together. Then, as the sun sank behind Peace Hill, the couples said “I do” once again, pledging to love, honor, comfort and keep each other for life. Afterward, Porter asked them to step toward the water’s edge as she bestowed an island blessing. Celebration and cheering followed. Judi and Arthur Rosenthal and Barbara and Jack Yellen, a set of friends from St. Thomas, were all smiles as they popped open a bottle of Champagne they had brought along. Judi and Arthur remembered how they had met and dated in eighth grade, when they both had braces. “Everyone was afraid we would hook them together,” he said. And Barbara and Jack had decided to get married on their second date. On. St. Croix, Capt. 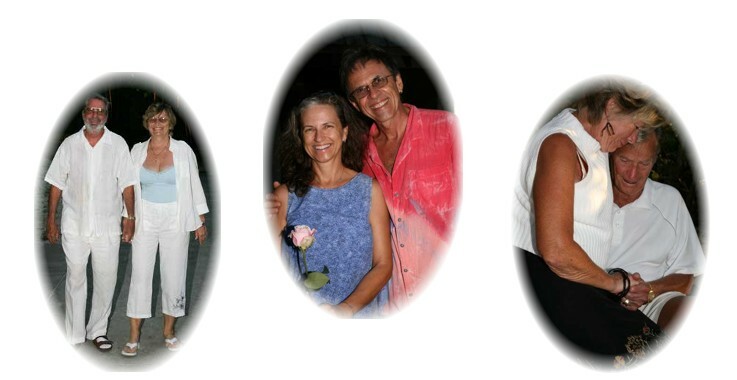 John Macy led a vow renewal ceremony at the Carambola Beach Resort at sunset Thursday. Macy, who has been presiding over marriage ceremonies for 21 years, has lead vow renewal ceremonies on Valentine’s Day for several years on St. Croix in an attempt to match the annual vow renewal ceremony on St. John. Six couples participated in the ceremony, which was complimentary from the Carambola Beach Resort and Macy. Contact Lynn Freehill at 774-8772 ext. 311 or e-mail lfreehill@dailynews.vi. 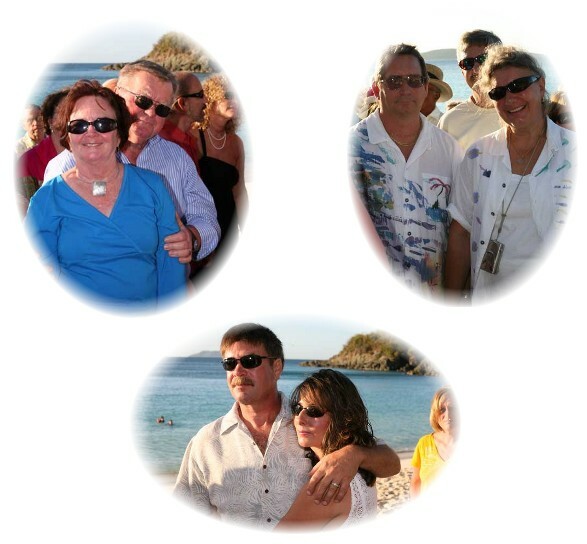 Feb. 14, 2008 — As they have for several years running, St. John snowbirds John and Barbara Achzet took top honors for being married the longest at the sixth annual Celebration of Love Valentine’s Day vow-renewal ceremony Thursday at Trunk Bay, St. John. They have been married for 60 years. “I can’t believe it myself,” Barbara said. Another St. John snowbird couple, Nan and Bob Barlow, are right behind the Achzets: They’ve celebrated 57 wedding anniversaries. Wearing a Mayan wedding dress she bought on a trip to the Yucatan back in 1972, Barbara said she wouldn’t know what to do without her husband by her side. A record 95 couples attended the sunset ceremony, said organizer Cathy Dove. That represented about 1,900 years of marriage. Non-denominational minister Anne Marie Porter led the couples in renewing their wedding vows. “Every moment of your lives brought you to this one,” she said, as John waggled his eyebrows at Barbara. The Achzets attended the ceremony with Webster, N.Y., residents Pat and Ron Seitz. They’ve been married 50 years. When asked why he stayed with his wife all these years, Ron Seitz said, “Well look at her — who’d leave her?” Laughing, he added, “And she isn’t even rich.” They have a lot of fun together, Pat said. Others offered more serious answers. “I want to reassure Mary that I do love her and am committed to her,” said Gary Crain of Muskegon, Mich., who has been married 15 years. Mary has everything figured out, he said, but he’s still trying to learn. The Seitzes are vacationing at Best Western Emerald Beach Resort on St. Thomas. 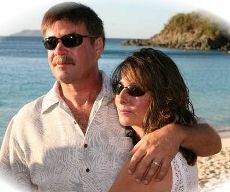 Another vacationing couple, Jo and Frank Fachman of Minneapolis, got married 14 years ago on St. Thomas. “We’re here to remind ourselves,” Frank Fachman said. Carolyn and Rich Sells of Richmond, Va., got married on Valentine’s Day two years ago. After a morning wedding on St. John, they attended the vow-renewal ceremony in their wedding finery. They weren’t quite as dressed up for this year’s ceremony, but the feelings were still the same. “We keep renewing our vows to recapture that feeling of getting married here,” Carolyn said. “It’s an excellent memory.” Joe and Pam Hudka of Lakeside-Marblehead, Ohio, are on St. John for the winter. Married for 39 years, the two said they thought renewing their vows would be a fun thing to do. Valentine’s Day is always extra-special on St. John, with couples flocking to Trunk Bay at sunset to renew their vows in the annual ceremony. Presided over by St. John’s own “Barefoot Minister,” Anne Marie Porter, this year’s ceremony was a beautiful reminder of why marriage is still a valued institution. Many couples return every year to gaze into one another’s eyes and remember why they’re still together and in love. Couples renew their commitment to one another at the Valentine’s Day vow renewal at Trunk Bay beach. Photo by Andrea Milam. Ninety-five couples representing 2,065 years of marriage renewed their vows to one another at the idyllic setting of Trunk Bay beach on Valentine’s Day as the sun dipped into the sky below Peace Hill. The Thursday evening, February 14, sixth annual vow renewal ceremony organized by Bill and Cathy Dove and conducted by St. John’s barefoot minister Anne Marie Porter, drew a record number of couples — including Barbara and John Achzet, who will celebrate their 60th year of marriage this year. The Achzets are regulars at the yearly vow renewal ceremony. “It’s good for young people to see us oldies hang in there for a while,” said Barbara Achzet. Newlyweds were also on hand at the ceremony, including Rich and Carolyn Sells of Richmond, Virginia. The couple, who renewed their vows just hours after their wedding in 2006, celebrated their two-year anniversary at the ceremony. “If we keep renewing our vows, we know we’ll stay married,” said Carolyn Sells. “It helps us capture that feeling again.” The first two years of marriage have been “excellent” for the couple, Rich Sells added. Couples gathered on the beach as Cathy Dove, who herself has been married to husband Bill Dove for 35 years, opened the ceremony. “Marriage is a work in progress,” said Cathy Dove. “There never seems to be enough time, or enough days in the year to say I love you.” Dove urged couples to share their feelings of love openly and often, as one is never guaranteed their loved ones will be around tomorrow. Local singer Shikima Jones then sang “What a Wonderful World,” encouraging the crowd to join in singing with her. Porter lightened the mood as she addressed the couples before the renewal of vows began. “Today when you say ‘I do,’ it’s with a lot more information than the first time,” said Porter. “You know yourselves so much more deeply than you did years ago when you had the hopefulness and courage to say ‘I do.’ Every moment of your relationship has prepared you for this one.” Porter urged couples to let go of past hurt and resentment. The couples gazed into one another’s eyes with their hands placed on each other’s hearts as they renewed their commitment to one another. The couples then walked to the sea to ponder their future together, and some celebrated with champagne. Couples were given a rose and a vow renewal certificate at the culmination of the ceremony.